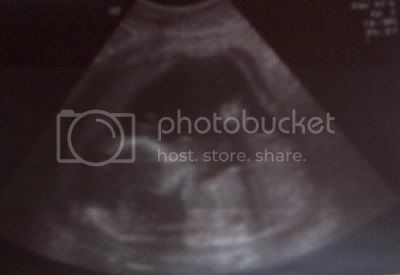 We had our ultrasound today. At twenty weeks, the baby's growth and development look blessedly normal. Now I can finally start looking for some baby clothes...IN PINK! Awww...congrats on the girl! That's so exciting! She's beautiful already. That is so wonderful! Many congratulations and may God continue to bless you both. I am thrilled for you! I am a fairly new reader and have been so blessed by your blog. Thank you from the bottom of my heart! God's best to you and your family! Oh, a little girl! How wonderful! What a blessing! Congratulations! Sugar and Spice and everything nice...How wonderful! As a mother of 2 daughters ( and 2 sons) I can say you are in for a wonderful time. Girls rock! LOL. Congratulations! Is your son looking forward to having a sister to look out for? I might have some pink things I can pass down, if you are interested. How wonderful!! I'm sohappy for you and your husband (and son too). May God continue to bless you. Congrats! hope everything continues in this wonderful way. from your brother--good luck with the upcoming purchases of clothes and toys for the girl. I have three sons, I come from a family of all brothers, my husband has only brothers, and I even had only boy cousins on one side of the family when I was growing up. So imagine how thrilled I was to find out two years ago that I was pregnant with a LITTLE GIRL!!! That baby girl turned two years old TODAY, and she is the delight of my life. It has been so much fun, and such a blessing, to already sense a kindred spirit with my beautiful daughter. You will LOVE having a little girl, and it wil make your little boy even that much more precious to you. Many, many congratulations to you!!! Oh, congratulations! She is beautiful. May God ever so richly bless all four of you! Oh I am so happy to hear you're havinmg a girl! I have 3 boys and wished (at the time of pgcy) that mine were girls. Can't wait for the BIG arrival of a new little future helpmeet! Congrats girlie!